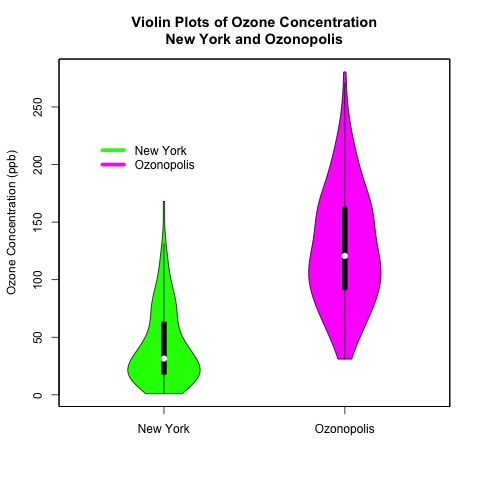 I previously explained the statistics behind box plots and how to produce them in R in a very detailed tutorial. 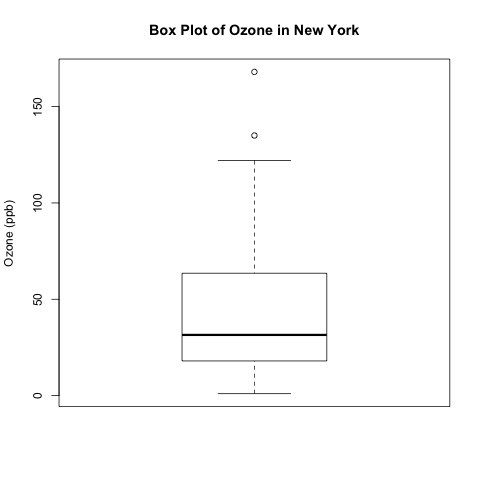 I also illustrated how to produce side-by-side box plots with contrasting patterns in R.
Here is an example of how to make box plots in SAS using the VBOX statement in PROC SGPLOT. I modified the built-in data set SASHELP.CLASS to generate one that suits my needs. 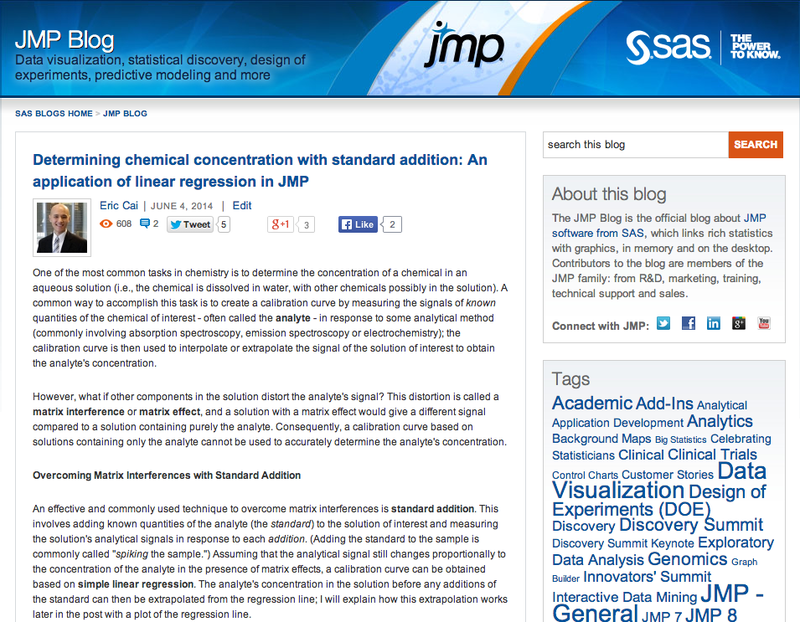 This series of posts introduced various methods of exploratory data analysis, providing theoretical backgrounds and practical examples. Fully commented and readily usable R scripts are available for all topics for you to copy and paste for your own analysis! 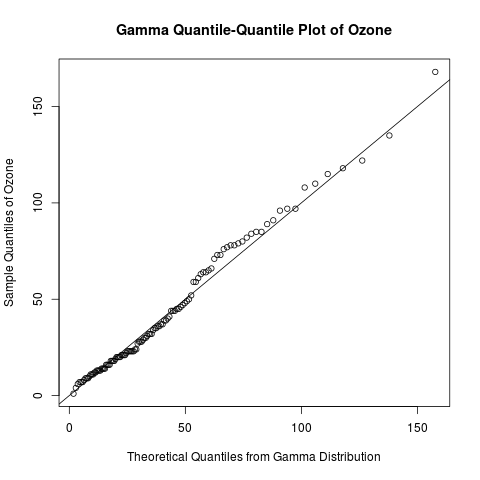 Most of these posts involve data visualization and plotting, and I include a lot of detail and comments on how to invoke specific plotting commands in R in these examples. I will return to this blog post to add new links as I write more tutorials. 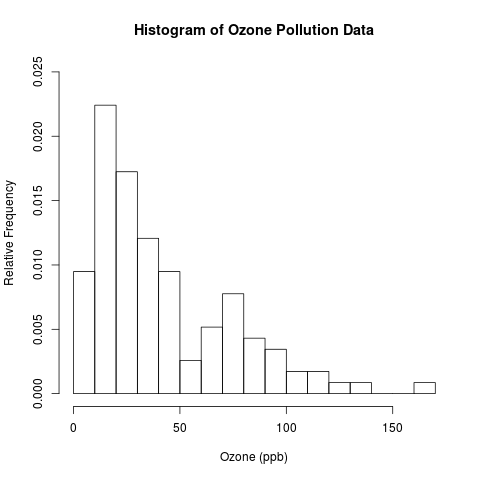 Joanna Zhao, an undergraduate researcher in the Department of Statistics at the University of British Columbia, produced a visual index of over 100 plots using ggplot2, the R package written by Hadley Wickham. 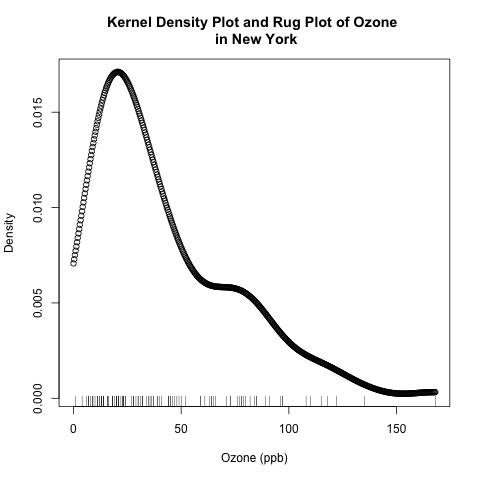 An example of a plot and its source R code on Joanna Zhao’s catalog. Click on a thumbnail of any picture in this catalog – you will see the figure AND all of the necessary code to reproduce it. 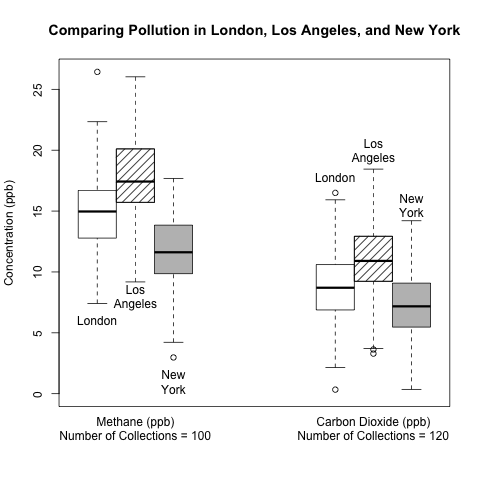 These plots are from Naomi Robbins‘ book “Creating More Effective Graphs”. then this is a great resource for you! A related GitHub repository has the code for ALL figures and the infrastructure for Joanna’s Shiny app. I learned about this resource while working in my job at the British Columbia Cancer Agency; I am fortunate to attend a wonderful seminar series on statistics at the British Columbia Centre for Disease Control, and a colleague from this seminar told me about it. 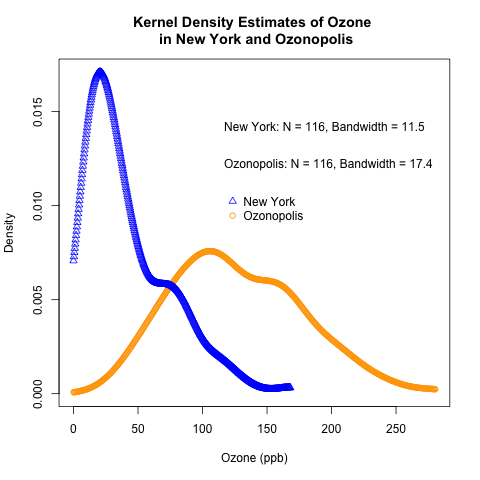 By sharing this with you, I hope that it will immensely help you with your data visualization needs! 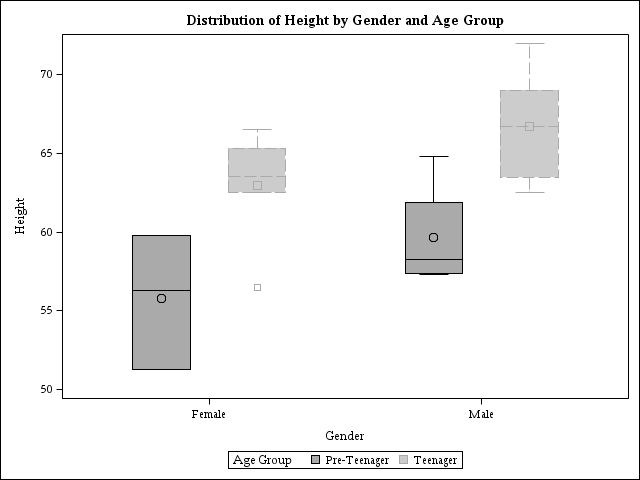 Continuing my recent series on exploratory data analysis (EDA), today’s post focuses on histograms, which are very useful plots for visualizing the distribution of a data set. 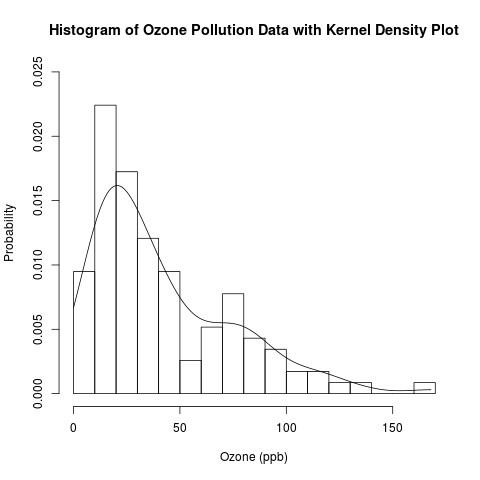 I will discuss how histograms are constructed and use histograms to assess the distribution of the “Ozone” data from the built-in “airquality” data set in R. In a later post, I will assess the distribution of the “Ozone” data in greater depth by combining histograms with various types of density plots. 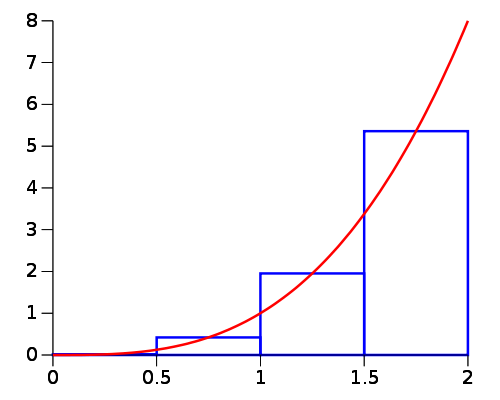 Read the rest of this post to learn how to construct a histogram and get the R code for producing the above plot! 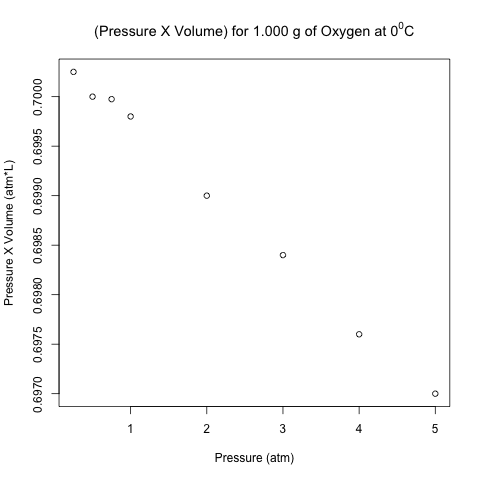 Today, I will talk about the math behind calculating partial correlation and illustrate the computation in R. The computation uses an example involving the oxidation of ammonia to make nitric acid, and this example comes from a built-in data set in R called stackloss. 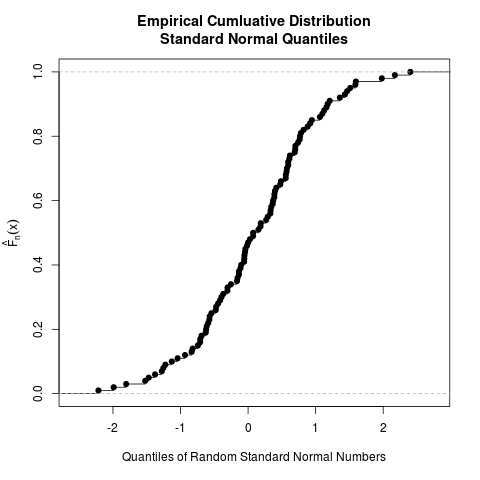 I read Pages 234-237 in Section 6.6 of “Discovering Statistics Using R” by Andy Field, Jeremy Miles, and Zoe Field to learn about partial correlation. They used a data set called “Exam Anxiety.dat” available from their companion web site (look under “6 Correlation”) to illustrate this concept; they calculated the partial correlation coefficient between exam anxiety and revision time while controlling for exam score. 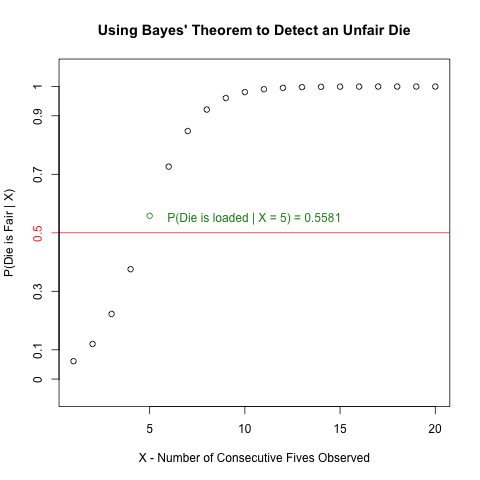 As I discuss further below, the plot between the 2 above residuals helps to illustrate the calculation of partial correlation coefficients. 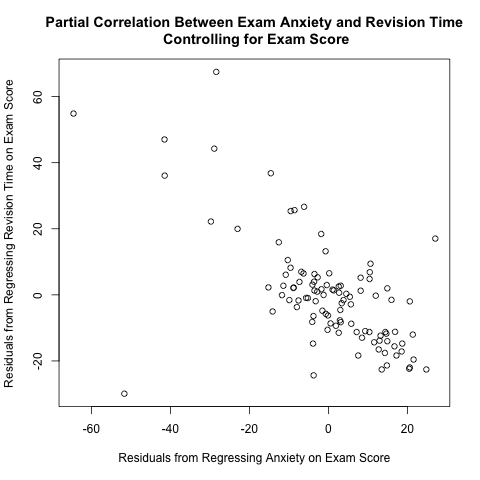 This plot makes intuitive sense; if you take more time to study for an exam, you tend to have less exam anxiety, so there is a negative correlation between revision time and exam anxiety. They used a function called pcor() in a package called “ggm”; however, I suspect that this package is no longer working properly, because it depends on a deprecated package called “RBGL” (i.e. “RBGL” is no longer available in CRAN). See this discussion thread for further information. 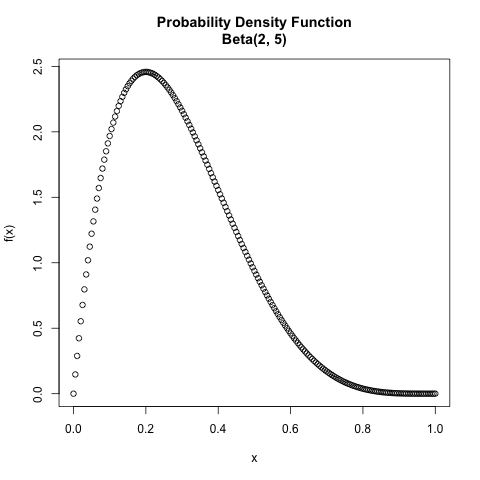 Thus, I wrote my own R function to illustrate partial correlation.